Marette Hahn, student success specialist for the College of Science, Engineering and Technology, speaks with members of the Canyon Activities Board over the summer about the results of their Indigo Assessment. Marette Hahn never will forget the day a freshly minted Grand Canyon University graduate dropped into her office, the big, bright, wide world rolling out the red carpet for him, spilling out all of its possibilities. It was the summer after he graduated, his premed degree in biology still fresh in his hand. He was going to be a doctor. His parents wanted him to be a doctor. “But he had no desire to go into medical school,” Hahn said. It wasn’t a fun conversation to have, Hahn said. 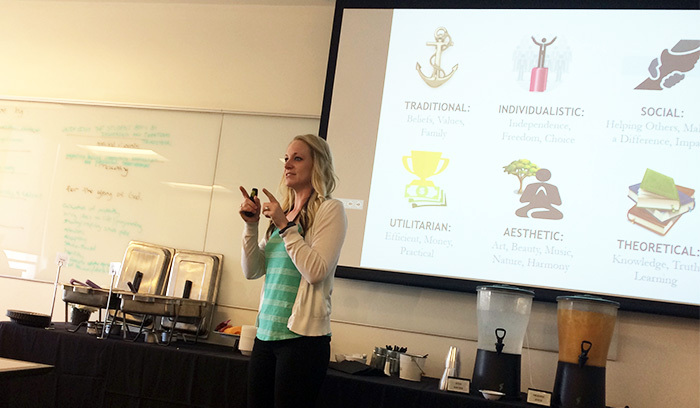 Members of the Canyon Activities Board took the Indigo Assessment, a comprehensive personality and career assessment, over the summer. Several Student Engagement groups and full-time employee groups at GCU have taken the survey to help with team-building. These days, when the College of Science, Engineering and Technology student success specialist speaks to students, she often tells that story. Stories like that are part of the reason why CSET takes a unique approach in serving its students and helping them find “their God-given purpose,” as CSET Dean Dr. Mark Wooden calls it. It was in 2015, when GCU built its engineering programs, that the college started using the Indigo Project’s Indigo Assessment, a comprehensive career and personality assessment the department gives to its freshman engineering students. This year’s cohort has until Sunday to take the survey before Hahn starts making her rounds in the engineering classrooms on Monday to “debrief” students on the results. CSET Dean Dr. Mark Wooden said the assessment helps incoming engineering students determine early on whether their choice of an engineering major is truly in line with their internal motivators. CSET is the only college on campus to incorporate an assessment like this into the curriculum, though Career Services does offer Career Compass to all GCU students who are trying to find a career path. Just call it a personality and career survey on steroids. 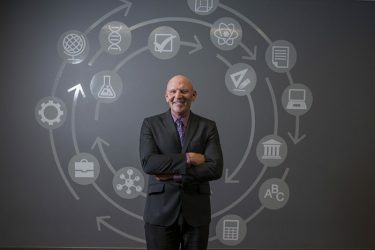 “We were looking for something that would help incoming students determine early on whether their choice of an engineering major was truly in line with their internal motivators and capitalized on their unique strengths,” Wooden said. Even if the student hasn’t asked, “Do I have the personal disposition and skills for the field I’ve chosen?” Or, “Will I be entering a career truly meant for me?” Wooden said, no problem. The department is asking – and answering – those questions through the survey. When helping craft the engineering program, Dr. Michael Sheller, Associate Dean of Engineering at the time, wanted the program to be more than merely academics. Such assessments have been used in corporate America for development training for decades. But in recent years, organizations such as the Indigo Project have found value in assessing college and high school students, too, and making them self-aware. Not that the assessment’s value is just in suggesting career choices. 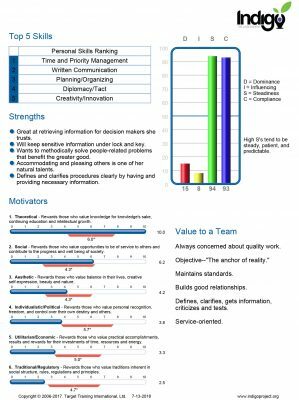 It also gives insights into what motivates people, what value they have on a team and even how to improve their study skills. The assessment incorporates the DISC model, which outlines four behavioral styles — dominant, influencing, steady and compliant. The survey, which analyzes a person’s behavioral style, motivators, social emotional perceptions and 21st-century skills, takes about 45 minutes to complete. It asks students to rank, for example, what’s most important to them out of a list of 20 or so possibilities. Would it be a new car that’s ranked at No. 1? Or helping others? The survey wants to know if you value beautiful surroundings or if you like learning just for learning’s sake. After completing the assessment, students receive a more than 20-page report detailing their top five skills, motivators, their strengths and their value to a team. “It’s scary how accurate it is,” Hahn said of her own Indigo report. A major part of the assessment is the DISC Model, which divides people into their behavioral styles: dominant, influencing, steady or compliant. 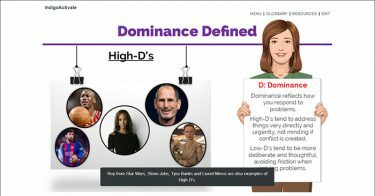 High dominants are big-picture risk-takers and go-getters, while low D’s are the more team-oriented peacekeepers. Influencers are the enthusiastic ones who need to be in an environment where they’re working with people. “High I’s are going to be the people who talk to people on the plane sitting next to them,” Hahn said. Those who score high in steadiness are loyal, calm, reliable and consistent — the ones who drive the same way to work every single day – while low S-scale people need constant change. Those who are high on the C-scale, or compliance scale, want to know exactly what is expected of them. However, low C’s are “going to find a workaround; they’re still going to try to get that end result, but they’re going to get it in a different way,” Hahn said. Mechanical engineering technology professor Dina Higgins has used results from the Indigo Assessment to build student teams, particularly lab groups. She said she has put teams together made up of members who all were congenial types that got along well. But that combination hasn’t always yielded the best results. Faculty have access to a dashboard and can pull up students’ profiles, see their classes, get a sense for their behavioral styles and put together effective teams based just on communication style, for example. 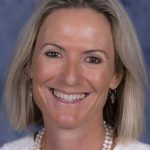 As for how the assessment helps students, Higgins said that those who might have doubted their choice in their career path will see their attributes highlighted in writing: “I think it’s a real good morale-builder. They realize they do have those tools to be successful. It’s like their swagger comes back,” she said. Higgins has taken the survey herself. It helped her realize why she wasn’t the best fit for a business-development job she once had. She was good at the educational portion of that job but said she never wanted to close the sale. Looking at her Indigo results, she was reminded how money isn’t a motivator for her. She loves the “time-wasters” portion of the assessment, too, which details for the user what might hinder someone from maximizing their time. Higgins said the DISC Model has been used in the corporate world for years. Having taken this sort of assessment in college gives students an advantage. They might, for example, realize their boss is a certain behavioral type and will know when to back off. While CSET is the only college to incorporate the Indigo Assessment into its curriculum, it isn’t the only department on campus using the survey. After hearing about the test, other groups on campus have been interested in taking the assessment, too. CSET has collaborated with Student Engagement to help facilitate that. The Associated Students of GCU, for one, “fell in love with it,” Hahn said. She has completed Indigo Assessment training with not just ASGCU but with the Canyon Activities Board, Freshmen Class Council and full-time staff, too. The Indigo Assessment is incorporated into the freshman engineering curriculum. 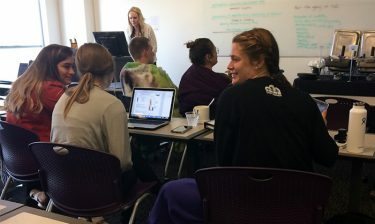 Rizella Espiritu, ASGCU club advocate and a sophomore nursing student, took the assessment with fellow ASGCU members during leadership training at the end of summer. The students shared their results with each other and attended roundtable discussions. “A big part of it was to learn from each other and learn how we work differently,” Espiritu said. While the group used the survey mainly for team-building, King said it also guided them toward careers that meld with their personalities: “It helped you to know what environment you work best in,” she said. Not that the assessment’s career guidance is an absolute be all, end all. Hahn said that whatever the Indigo report says, students ultimately have the power to decide what they’ll be doing after they leave the GCU campus, and they have their career and personality assessment as a tool to help them make those decisions. “It’s not that you can’t do it. It’s that you’re really going to have to push yourself to do it if it doesn’t come naturally to you,” she said. While engineers are high in steadiness and compliance, Higgins said she doesn’t fit the mold. She scores extremely high as an influencer and is an enthusiastic people person. What there is is the knowledge that the world still will be rolling out that red carpet and spilling out all of its possibilities.